Sunday Morning Sermon at Open Door Church was by James, and my notes reflect an edited message. People often ask “Where are you from?” and although I live in Oroville, my reply was usually; Chico, because no one knows where Oroville is. Oroville is considered poor and in darkness. 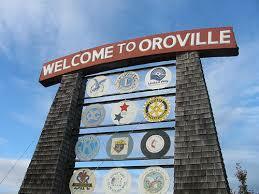 I was embarrassed to admit I was from Oroville, because of the homeless and drug addiction situation here. The first time I visited this Oroville church, my thoughts were “What am I doing here? I don’t want to be here? Then God changed my heart. We need to pray for heart changes. Oroville has many treasures not yet discovered. 1 Corinthians 12:9 And he said unto me, My grace is sufficient for thee: for my strength is made perfect in weakness. The church at Corinth disappointed Paul. They drifted back into their old ways and made foolish decisions. Understand it is never hopeless even if new believers don’t measure up to our expectations. Every day there is something new as we go about simply doing our work for God. Use what you have and expect God to bring the increase. Our community is open and being reached; our Hope Center is ministering to many. Here at Open Door, our Sunday morning feeding before church is blessing many. Do come out to the Wednesday Night Bible Study. Satan desires to discourage, but it is time to realize we can do something about change in our city. We can prophesy and predict change in the hearts of our citizens. About that time, a lady in the front row spoke up and held up a small wooden box offering it to James. He reached out and received it and said, this box contains marijuana and the lady is giving it up. God will remove the "thing" that she thought needed the marijuana. We suffer but God is able to fill up the lack and the needs we have. The heart of God is broken as he sees the many needs, but He rejoices as people turn to Him and allow Him to remove their pain and sorrow. God is sending angels to open prison doors. He desires to lift people out of all their troubles. You can pray anywhere. I pray in my truck, and know Jesus is sending hope to the hopeless. If people think I am talking to myself, I wave at them. Start marching for Jesus. Let the Holy Spirit show you how to minister. Our community needs our witness. The Holy Spirit will magnify and multiply what you do in Jesus name. Pastor Allan took the microphone and shared: There are some really bad things in Oroville, but God is working to change all that. God has a purpose and a good plan for our city and He desires to rise up an army of believers. We will dismiss, and please come to the front of you desire prayer. Many went forward. God calls His chosen to the places for His perfect will and purpose. What a wonderful reminder and testimony.